By the early 1990's the building had got into a very poor condition. 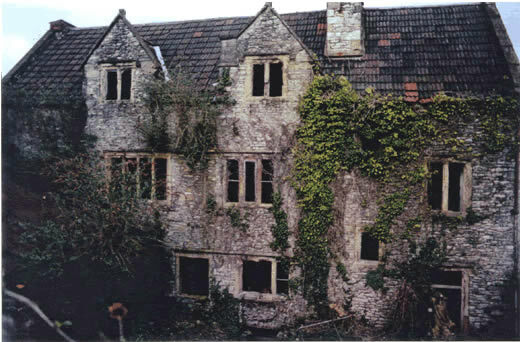 It had been identified as a building at risk both by Mendip Council and English Heritage for some considerable time and figured on both of their Building at Risk Registers. Sadly a large proportion of the town centre had been demolished around 1970 to make way for a concrete town centre complex. This building was lucky to survive being about only 6 metres away from the development. I bought the building in February 1994 and started work exactly 10 years later due to personal problems and a high level of research and planning required too. A building of this nature needs to be examined carefully before work proceeds and the work should be carefully planned around what is found. The building is a late 17th century wool merchant's house with two adjoining tenements now forming part of the same house after being knocked through by the Victorians. It was all built to be tenented. By June 2005 the shell of the building was completed into a wind and water tight building again so we celebrated with a topping out ceremony before removing the scaffolding which had shrouded the building for three and a half years. During November 2005 we had the BBC Restored to Glory team come and film the property as an example of work in progress undertaken in an exemplary fashion by a conservation builder. They brought two film crews, two producers and two assistants. The presenter Charlie Luxton came with the three experts Ian Constantinides, Jo Hibbert and John Yates. The program was screened on the 22nd December at 8pm on BBC2 as an educational program. I received some excellent quotes including "The perfect philosophy of conservation" and "All the right tradesmen and all the right materials". Respected expert James Ayres has also visited the building to look at the decoration schemes. His conclusion was that there is artwork here of a style which is unique in his experience although it could have been based on work at Longleat House and incorrectly interpreted. See James book Domestic Interiors: The British Tradition 1500-1850 and look for his other titles too. Since the shell was completed it was a time consuming process getting the inside finished. However the timescale has worked well allowing the green oak to shrink back before the plastering was done and has enabled me to obtain the finish I was looking for with minimal making good required later. During August 2008 we received the news that we had won a full award in the William Stansell award for building conservation from the Somerset Building preservation trust. September 2008 has seen the work completed so we can move in. During April 2009 we received a special award from Mendip Council in their Built in Quality awards This means we have been shortlisted in the South West Local Authority building Control Awards regional heat in June 2010.